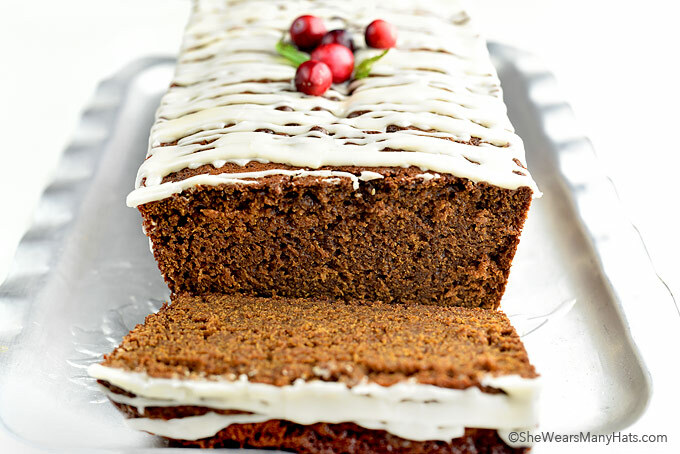 The spicy homemade Gingerbread Loaf made with ginger, cinnamon, allspice, cloves and molasses is such a lovely treat to enjoy with coffee or tea. If you wish, drizzle with a simple vanilla glaze for a festive treat that tastes just like the holidays. Each year when the holidays roll around I can’t seem to satisfy my gingerbread cravings. And each year when the holidays roll around and I can’t seem to satisfy my gingerbread cravings, I wonder why gingerbread is only enjoyed during the holiday season? Why not all year long? Who makes these rules anyway? I’m all about breaking the rules and chains that hold us back so I vote for gingerbread all throughout the year! Who is with me?!? 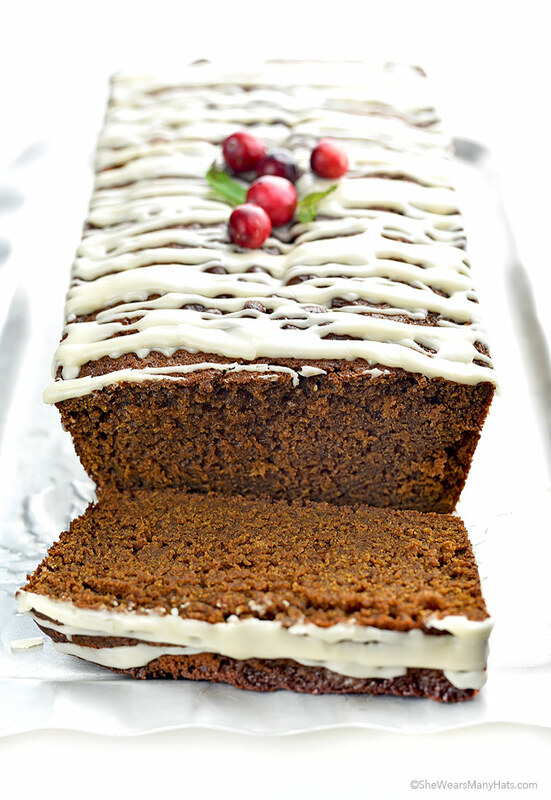 Regardless of when you choose to enjoy gingerbread, do try this Gingerbread Loaf recipe soon. The aromas this warm spicy treat fills your home with is enough reason to bake a loaf or two. Make one for your home and another to share. This spice-filled loaf is simple to prepare. The batter comes together quite easily. Begin by whisking all of the dry ingredients together. Separately, beat together melted butter, molasses, eggs, buttermilk and vanilla extract until combined. Add wet ingredients to dry ingredients and stir until just combined, being careful to not over mix batter. Pour batter into prepared a 9×5 inch loaf pan and bake until done. It takes about 50 minutes or so to bake. Let the loaf cool in the pan for 10 minutes before transferring to a cooling rack to finish cooling before serving (if you can wait that long!). The Vanilla Glaze Drizzle is optional. Honestly, I really prefer this gingerbread loaf without the glaze. Gingerbread is so flavorful and sweet enough all by itself. The glaze does add a pretty touch for holiday celebrations and is super quick to make and drizzle over the loaf once it has cooled. I think you’ll really enjoy this Gingerbread Loaf. My recommendation? Cozy up with a slice of this gingerbread and a warm cup of tea while watching your favorite Hallmark movie for the perfect holiday break. It doesn’t get much better than that. 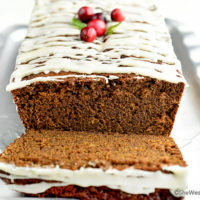 The spicy homemade Gingerbread Loaf made with ginger, cinnamon, allspice, cloves and molasses is such a lovely treat to enjoy with coffee or tea. Drizzle with a simple vanilla glaze for a festive treat that tastes just like the holidays. Adjust rack to middle of oven. Preheat oven to 350-degrees F. Grease and flour a 9x5-inch loaf pan. In a large mixing bowl, whisk together flour, sugar, baking soda, salt, ginger, cinnamon, allspice and ground cloves. Stir wet mixture into the dry ingredients until combined. Do not over mix. Pour batter into prepared pan, and bake until a toothpick or cake tester inserted into center of the cake comes out clean, about 50-55 minutes. The cake will just begin to pull away from the sides of the pan. Allow cake to cool in pan for 10 minutes, then turn out onto cooling rack to finish cooling. Mix all ingredients together until smooth. Add more milk or confectioners' sugar as needed for desired consistency. Drizzle cooled cake with glaze. I have been thinking of making small loaves of tea breads as gifts for my co-workers and just this morning I was thinking that it would be good to find a gingerbread loaf for one of the breads. You must have heard me thinking! Thank you for sharing this; it looks perfect! I think this would also be great with a lemon icing. I occasionally buy some special gingerbread muffins that have lemon frosting and they are wonderful! One of my favorite cookies is gingerbread with lemon filling so I think that is a fabulous idea, Leslie! Such a lovely combination. I’m going to try with that myself next time. Wow, how pretty is that! We may prefer it without the icing, too, but it is so festive looking with it. Jac is always on the hunt for good gingerbread recipes, so I need to try this. Oh, I think y’all will enjoy this one! I’m not sure of exact adjustments for a bundt pan but I think it would need to be doubled for a bundt pan, as well as the cook time and possibly temperature adjusted. Sulphured or unsulphured molasses? Dark or light? What brand/kind do you use? I used the unsulphured Grandma’s brand. This looks beautiful! 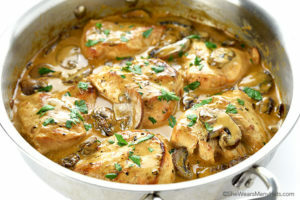 What is the temperature and cook time if using smaller pans? I have not cooked this gingerbread in smaller pans so I am not sure. I would try cooking it at the same temperature until done. Obviously a shorter time will be required. Yes. Let it cool completely then wrap tightly in plastic wrap then insert in a freezer zip top plastic bag. Can I replace the buttermilk by something else ? If you can have milk, you can create your own buttermilk substitution by stirring in 1 tablespoon of fresh lemon juice to 1 cup of milk. Let it sit for about 5-10 minutes before adding to the recipe. Hello! THIS looks absolutely amazing!!!! I can’t have buttermilk. Could I use almond milk instead? You may, although the texture may be slightly different. Can I use powder butter milk? I would not recommend that. If you can have milk, you can create your own buttermilk substitute by stirring 1 tablespoon of fresh lemon juice into 1 cup of milk. Let it sit for about 5-10 minutes before adding it to the recipe. Can half and half replace the butter milk? Yes, but the texture may be slightly different. You can also create your own buttermilk substitution by adding 1 tablespoon of fresh lemon juice to 1 cup of milk, and let sit for about 5-10 minutes until it looks curdled. Rather than a glaze……I was thinking of a butter sauce with whip cream. Thoughts??? What is the green garnish on top? Just made this delicious treat yesterday & between my husband & myself it has completely evaporated! I plan on making more to put in gift baskets. Just one question however. I find that the vanilla glaze, although nice & white when I drizzle it on, shortly thereafter it turns into a clear/unappealing colour. Any tricks to keeping it nice & white since I plan on giving them out at .Christmas? I don’t have any tricks. Although it is pretty, I rather prefer it without the icing. I had this same issue this evening, was quite bummed it isn’t pretty white as photographed. Just made this and it tastes as good as it looks! Thanks so much for the recipe. I will be adding it to my Christmas baking list. Happy to hear it, Mary! Do you think this would work with almond flour instead of the normal flour? I do not know how it would work with almond flour as I have not make it yet with it. This looks wonderful! I plan to bake some loaves and will skip the icing and instead do a light dusting of powdered sugar over the top. Thanks for the recipe! I wound up dividing my batch between two 8″ x 4″ loaf pans and baked for 35 minutes, which seems to be perfect. This recipe is very moist and a wonderful consistency. I wound up doing a light dusting of powdered sugar as well as drizzling the icing over the top…I felt like the gingerbread needed a little extra kick of sweetness. Great recipe! Thank you for sharing the cook time for that pan size, Karen. I’m so happy you enjoyed it! 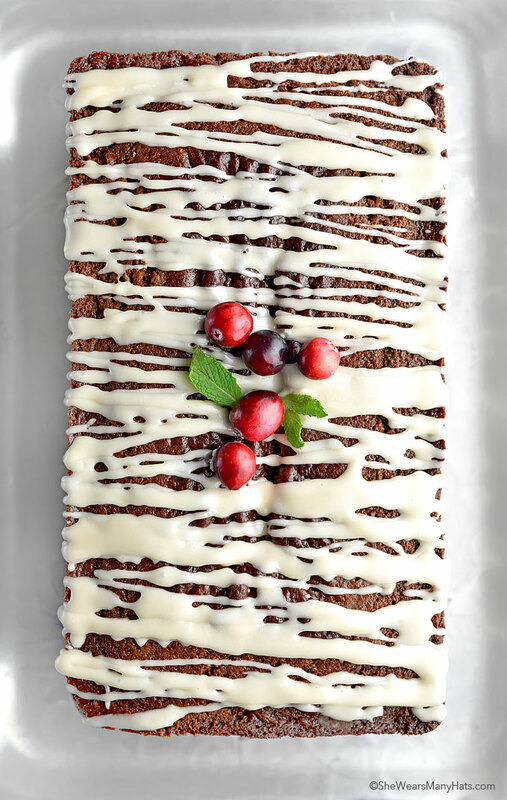 Has anyone tried cream cheese icing or a drizzle of the same on this spice cake? A cream cheese icing or drizzle is lovely with this cake, Cynthia. I’m baking this tonight for an event tomorrow morning! I was just wondering how you store it? I apologize for the delayed reply. I store it covered at room temperature. Is there room to add pears to this? Cant seem to find a nice gingerbread recipe which this so is – not vital but would like to see if I could do this (due to an excess of pears just now!) Many thanks and Merry Christmas. Replying to my own question – going to add poached pear on the side with whipped cream, etc. Just made the gingerbread – best ever ever – better than any Grandmother, etc. and served my pears poached in red wine – oh what fun! Thank you so much! Do you think the sugar could be increased with no ill effect? Depending on the amount, more sugar may change the texture of the cake. I’ve been baking for years and this Loaf is one of the finest I’ve ever tasted!!!!! Oh, thank you so much, Vance! I made this right after Christmas it was yummy! when I make recipes I give it 1 to 5 star rating, this way I know how well people liked it – this is 4.5 rating for me maybe even 5 star. Thank you for such a good recipe. Is that mint and cranberry on top? I just made this, it smells yummy! I was wondering how you got your drizzle so white? Once I added the vanilla, it was a caramel color. I used pure, dark vanilla from Mexico. It is a little tan but once cooled was a bit whiter. Hi, this looks so good! 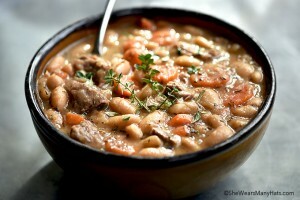 Have you tried doubling this recipe before? I’d like to make a few loaves and save time. What do you think? I have doubled it before. Happy baking!